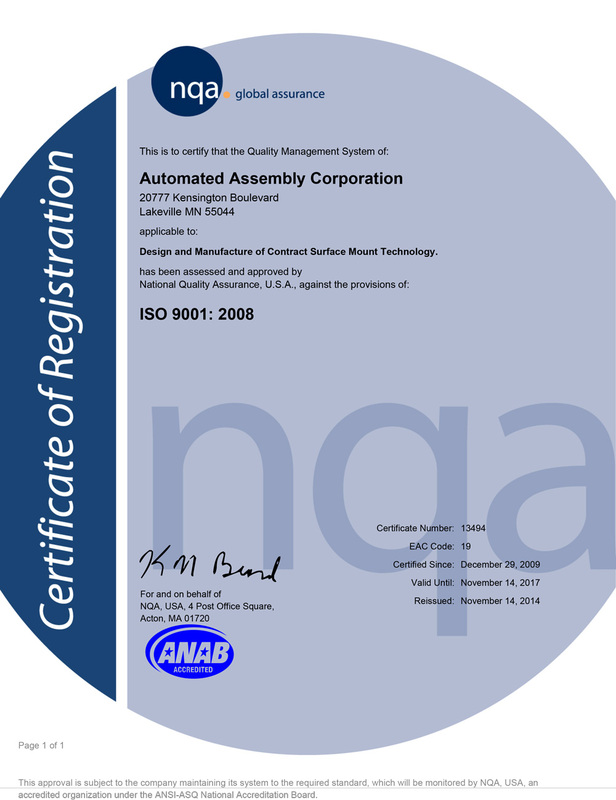 In 2008, Automated Assembly received certification through Orion Registrar, Inc. USA. ISO 9001 specifies requirements for a quality management system that can be applied to any size or type of organization. Certification to the standard demonstrates a company’s ability to enhance customer satisfaction while consistently providing product that meets customer and applicable regulatory requirements. The effective implementation of ISO 9001 gives your company the great competitive advantage of having the discipline to identify, understand and fully implement your customers’ needs, requirements and expectations, effectively drive down waste and production costs, while providing the high quality your customers expect. Its process approach allows you to increase your customers’ satisfaction, leading to a higher level of demand and profitability. By providing this visible commitment to your customers, you increase their confidence in your company and your product. 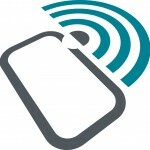 It also serves as an effective marketing tool to bring in new customers. **Not yet certified Environmental consciousness has become a worldwide concern, and nowhere is this more evident than the global marketplace. National as well as international markets are demanding a greater respect for the environment. Many industries require environmental management system certification. Certification to ISO 14001 provides a visible commitment to your customers, increasing their confidence in your company and your product. In addition, there are many benefits that may reward ISO 14001 implementation. Researchers at the University of Pennsylvania’s Wharton Risk Management and Decision Processes Center found that most of the ISO 14001 certificate holders responding to a national survey reported a relatively quick payback time on their investment. The survey data indicate that doing a thorough job up front in identifying environmental aspects and testing them for improvement leads to the bottom-line benefits that organizations expect from certification. Many organizations experienced a two-year financial payback, and some experienced a one-year return. The impact of internal gains in areas such as employee awareness, management awareness, and management involvement in environmental affairs was even greater, indicating that ISO certification streamlines a facility’s management system to produce long-term benefits. The Wharton survey was developed with input from ANAB and QSU?Publishing Company. **Not yet certified AS9100 is an international aerospace standard for quality assurance in design, development, production, installation and servicing. AS9100 certification can be attained by companies specializing in the supply of equipment, aircraft accessory supply, airport and airline operations, spares supply and maintenance, flight operations, cargo handling or other organizations interested in certification. It specifies requirements for a quality management system where an organization a) needs to demonstrate its ability to consistently provide product that meets customer and applicable statutory and regulatory requirements, and b) aims to enhance customer satisfaction through the effective application of the system, including processes for continual improvement of the system and the assurance of conformity to customer and applicable statutory and regulatory requirements. An increasing number of major aerospace contractors are now requiring the use of AS9100 by their supply chain, which is propelling its use throughout the industry. AS 9100 certification is encouraged for suppliers of Boeing, Rolls Royce Allison, GEAE, NASA, Honeywell and many others. By providing this visible commitment to your customers, you increase their confidence in your company and your product or service. **Not yet certified Hazard Analysis Critical Control Point (HACCP) is increasingly viewed as the best way to ensure farm to table food safety in the United States. HACCP approaches food safety through the analysis and control of biological, chemical and physical hazards. This process can be applied from raw material production, procurement and handling to manufacturing, distribution and consumption of the finished products. HACCP was created for use in all segments of the food industry, including growing, harvesting, processing, manufacturing, distribution, merchandising, and preparation of food for the consumer. THE U.S. Department of Agriculture and the U.S. Food and Drug Administration have already established HACCP for several industries, and new challenges to the U.S. food supply have prompted FDA to consider adopting a HACCP-based food safety system on a wider basis. These challenges include both the increasing number of new food pathogens and the increasing public health concern about chemical contamination of food. **Not yet certified Orion Registrar’s ISO 13485 auditors are exceptionally qualified with excellent medical device backgrounds and experience. It is Orion’s commitment to work together with our clients and to provide them with the highest level of professionalism and satisfaction. Orion auditors are reasonable and thorough and treat each of our clients with fairness and respect. They are not interested in promoting bureaucracy, but in learning the distinctive ways in which your company has met the requirements of the standard. You need not take Orion’s word for the skills of our staff and auditors, you also have the confidence of knowing that Orion’s customers consistently give us high rankings in independent surveys.